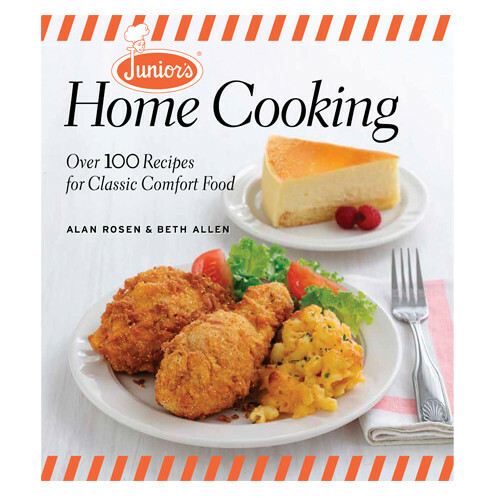 In Junior’s Home Cooking, Alan Rosen and Beth Allen bring Junior’s into home, with recipes and stories that have been passed down through generations of the Rosen family. The family-friendly dishes have been scaled down and professionally tested so that every home cook can turn out a meal just like the made-from-scratch versions featured at Junior’s. In Junior’s signature style, all dishes are delicious, “bigger and better than ever,” and perfect for both family meal and holiday table. Just like Junior’s other three books, this book features sidebars throughout on “The Junior’s Way”—tips and techniques. In addition, ideas for “super-sizing” a recipe to feed 8 or more will be included. Junior’s fabulous recipes will be showcased by more than 40 full-page, four-color photographs.